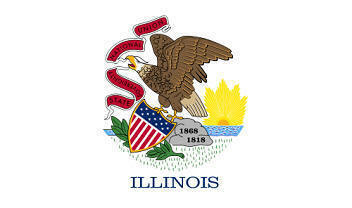 The State Flag of Illinois is dominated by the image of the American Bald Eagle depicting the motto "State sovereignty, national union" in its beak. A shield depicting the stars and bars is also prominent. The flag serves as a symbol of honor, heritage and regional pride and is displayed at state buildings. There is a strict Order of Precedence for flags. State Flags are displayed in order as they entered the Union. Car Flags are often displayed to represent of an individual's allegiance to their state. Illinois State car flags are used by their owners as mobile emblems of their home. Car flags are usually made from strong materials and are attached to a car via a pole and clip window attachment. What is the design of the Illinois state flag? The eagle carries a shield in its talons. The shield held by the eagle depicts stars and stripes representing the original thirteen states of the Union. Who designed the Illinois State Flag? The name of the original designer was by Lucy Derwent (who had won a contest in 1913), but was redesigned in 1970 by Mrs. Sanford Hutchinson. What is the history of the Illinois State Flag? The original flag was created in a contest sponsored by the Daughters of the American Revolution. The Illinois flag is kept and used as required by the code specified in the constitution of the state. Illinois Official Nickname "Prairie State"